In 2016, as in recent years, Millennials and Gen Xers were the most Democratic generations. 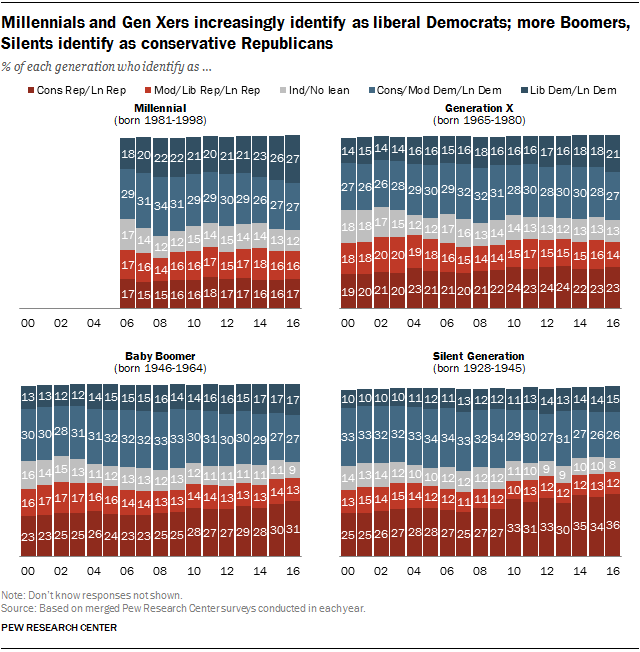 And both groups had relatively large – and growing – shares of liberal Democrats: 27% of Millennials and 21% of Gen Xers identified as liberal Democrats or Democratic-leaning independents. By contrast, Boomers and Silents were the most Republican groups – largely because of the higher shares of conservative Republicans in these generations. Nearly a third of Boomers (31%) and 36% of Silents described themselves as conservative Republicans or Republican leaners, which also is higher than in the past. 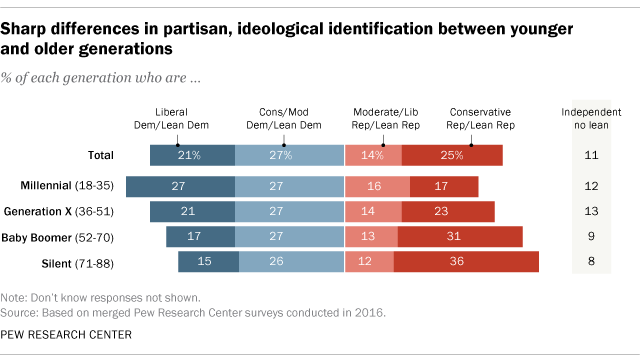 The differences in partisan identification across generations are most apparent in the shares of liberal Democrats and conservative Republicans in each. All four groups have comparable numbers when it comes to groups in the middle: conservative and moderate Democrats and moderate and liberal Republicans. 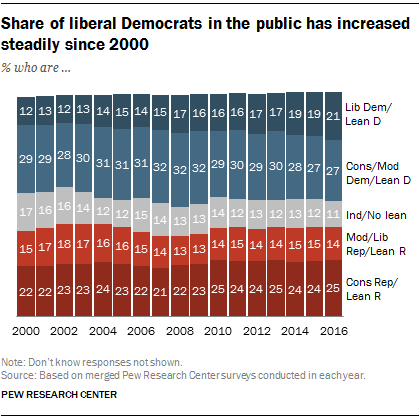 The share of liberal Democrats in the public has grown. In 2016, 21% of Americans identified as Democrats or Democratic leaners and also as liberal. While that is only somewhat higher than a year earlier (19%), it is the highest share dating back to 2000. At that time, just 12% of the public described themselves as both liberal and as Democrats or Democratic leaners. There has been little change since 2000 in other partisan and ideological categories, although the share saying they do not lean to either party is smaller today (11%) than in the early 2000s (17% in 2000). Millennials were most likely to identify as liberal Democrats. In 2016, a majority of Millennials (55%) identified as Democrats or leaned Democratic; 27% described themselves as liberal Democrats – the highest share of any generation. For much of the past decade, conservative and moderate Democrats outnumbered liberal Democrats among Millennials. But in the past few years, there were about as many liberal Democrats as conservative and moderate Democrats among this youngest adult age group (those who were 18 to 35 in 2016). The share of liberal Democrats in Gen X ticked up. As in recent years, conservative and moderate Democrats made up the largest partisan and ideological group among Gen Xers (27%), who were ages 36 to 51 last year. However, the share of Gen Xers who identified as liberal Democrats (21%) stood at its highest point since 2000. About as many Gen Xers (23%) described themselves as conservative Republicans, a figure that has not changed much in recent years. Boomers have turned more conservative. In both 2015 and 2016, about three-in-ten Boomers (30% in 2015, 31% in 2016) identified as conservative Republicans – the highest percentages dating back to 2000. In both years, conservative Republicans made up the largest single partisan and ideological group among Boomers. Members of the Silent Generation continued to be most likely to identify as conservative Republicans. The GOP has made large gains among Silents in recent years. Eight years ago, Democrats and Democratic leaners outnumbered Republicans and GOP leaners among Silents by 48% to 40%; in 2016, 49% of Silents identified as Republicans or leaned Republican, while 43% leaned Democratic. The share of Silents who describe themselves as conservative Republicans increased by 9 percentage points over this period, from 27% to 36%.